The CDCard includes a 20-track compact disc that features an all new music selection with many of the top artists and biggest hits of the Year. An ideal card and gift in one for birthdays, anniversaries or any Special day. 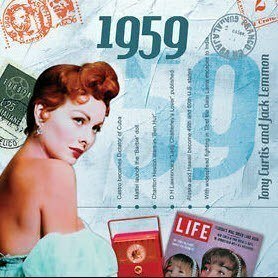 Please see below for the full track listing of the 1959 CD. 18. Johnnie Ray - Ill Never Fall In Love Again.